The heat treating of gears presents a difficult challenge to both the heat treater and the gear manufacturer. The number and variety of variables involved in the manufacturing process itself and the subsequent heat treating cycle create a complex matrix of factors which need to be controlled in order to produce a quality product. A heat treater specializing in gears or a gear manufacturer doing his own heat treating must have a clear understanding of these issues in order to deliver a quality product and make a profit at the same time. The situation also presents a number of areas that could benefit greatly from continued research and development. 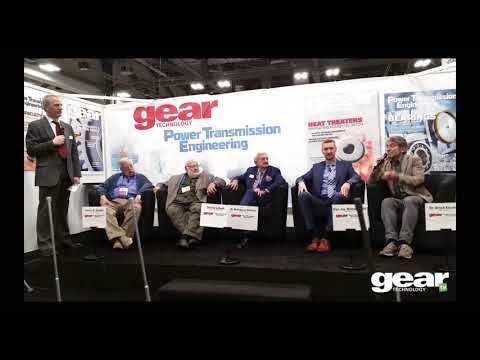 Chicago- Results of recent studies on residual stress in gear hobbing, hobbing without lubricants and heat treating were reported by representatives of INFAC (Instrumented Factory for Gears) at an industry briefing in March of this year. The induction hardening and tempering of gears and critical components is traditionally a hot subject in heat treating. In recent years, gear manufacturers have increased their knowledge in this technology for quality gears. News from around the world about heat treating. Map and listings to the ASM Heat Treating Society Conference and Exposition, which is co-located with this year's Gear Expo. New innovations in the management of hear treating parts washers and yielding powerful, unexpected benefits. Simply, cost effective shop floor practices are being combined in new ways to deliver big quality improvements and significant help to the bottom line. Employing these steps early in the process can dramatically cut waste hauling expenses and greatly reduce environmental liabilities while continuously producing cleaner parts. Heat treating is one of the most critical operations in the manufacture of quality gears. Everything can be done to perfection, but if the heat treating isn’t right, all of your hard work and efforts are wasted. We know how important it is for gear manufacturers to find the right heat treating service provider. That’s why we’ve compiled this Heat Treat Resource Guide -- the only directory of heat treat service providers that’s specific to the gear industry. The companies listed here are all interested in working with gear manufacturers, and many of them have specialties and capabilities that are uniquely suited to the types of products you manufacture. Heat treating and quenching are arguably the most critical operations in the manufacture of gears. This article examines causes of distortion in heat treating and quenching. 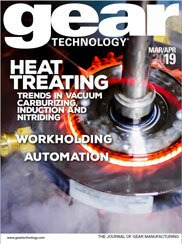 The October 2011 issue of Gear Technology featured the article “Low-Distortion Heat Treatment of Transmission Components,” which covered the combination of low-pressure carburizing and high pressure gas quenching in an automotive environment. Here, heat treating expert Dan Herring explains why oil quenching is an appropriate choice for many applications. Carburized helical gears with high retained austenite were tested for surface contact fatigue. The retained austenite before test was 60% and was associated with low hardness near the case's surface. However, the tested gears showed good pitting resistance, with fatigue strength greater than 1,380 MPa. Compared to non-heat-treated components, case-carburized gears are characterized by a modified strength profile in the case-hardened layer. The design of case-carburized gears is based on defined allowable stress numbers. These allowable stress numbers are valid only for a defined "optimum" case depth. Adequate heat treatment and optimum case depth guarantee maximum strength of tooth flank and tooth root. The selection of the heat treat process and the congruent material required for high performance gears can become very involved. An Interview with Dr. Valery Rudnev, FASM, IFHTSE Fellow, Director of Science & Technology at Inductoheat, Inc.
Heat treat suppliers look to the gear industry and the upcoming combined Gear Expo/Heat Treat 2013 for new business. What quality and performance characteristics should you look for? In recent years, improvements in the reliability of the vacuum carburizing process have allowed its benefits to be realized in high-volume, critical component manufacturing operations. The result: parts with enhanced hardness and mechanical properties. Durability is the most important criterion used to define the quality of a gear. The freezing of metals has been acknowledged for almost thirty years as an effective method for increasing durability, or "wear life," and decreasing residual stress in tool steels. The recent field of deep cryogenics (below -300 degrees F) has brought us high temperature superconductors, the superconducting super collider, cryo-biology, and magnotehydrodynamic drive systems. It has also brought many additional durability benefits to metals. This article covers preventive maintenance and modification to machinery to induction harden different types of gear. Heat treating is a vital step in the gear making process—that’s a given. But how that step is taken can happen in a number of ways. Heat treatment industry reinforces environmental/energy conservation. Here are some of the new products and technologies available to attendees at Heat Treat 2011. Co-located ASM and AGMA shows are a hot ticket. "God is in the details," says the philosopher. What he meant was that on the scale of the universe, it's not just the galaxies, the planets, the mountain ranges, or the major rivers that are important. So are the subatomic particles and the genes. It's the little things that make all the difference. Induction hardening is widely used in both the automotive and aerospace gear industries to minimize heat treat distortion and obtain favorable compressive residual stresses for improved fatigue performance. The heating process during induction hardening has a significant effect on the quality of the heat-treated parts. However, the quenching process often receives less attention even though it is equally important. Quality gear manufacturing depends on controlled tolerances and geometry. As a result, ferritic nitrocarburizing has become the heat treat process of choice for many gear manufacturers. The primary reasons for this are: 1. The process is performed at low temperatures, i.e. less than critical. 2. the quench methods increase fatigue strength by up to 125% without distorting. Ferritic nitrocarburizing is used in place of carburizing with conventional and induction hardening. 3. It establishes gradient base hardnesses, i.e. eliminates eggshell on TiN, TiAIN, CrC, etc. In addition, the process can also be applied to hobs, broaches, drills, and other cutting tools. The performance of metal surfaces can be dramatically enhanced by the thermal process of rapid surface melting and re-solidification (RMRS). When the surface of a metal part (for instance, a gear) is melted and re-solidified in less than one thousandth of a second, the resulting changes in the material can lead to: Increased wear and corrosion resistance, Improved surface finish and appearance, Enhanced surface uniformity and purity, and Sealing of surface cracks and pores. In the typical gear production facility, machining of gear teeth is followed by hear treatment to harden them. The hardening process often distorts the gear teeth, resulting in reduced and generally variable quality. Heat treating gears can involve many different types of operations, which all have the common purpose of producing a microstructure with certain optimum properties. Dual frequency induction hardening grew from the need to reduce cost while improving the accuracy (minimizing the distortion) of two selective hardening processes: single tooth induction and selective carburizing. Geoffrey Parrish has updated and expanded his previous book: The Influence of Microstructure on the Properties of Case-Carburized Components. It now contains at least twice the material. References and bibliography include 449 citations. The tooth-by-tooth, submerged induction hardening process for gear tooth surface hardening has been successfully performed at David Brown for more than 30 years. That experience - backed up by in-depth research and development - has given David Brown engineers a much greater understanding of, and confidence in, the results obtainable from the process. Also, field experience and refinement of gear design and manufacturing procedures to accommodate the induction hardening process now ensure that gears so treated are of guaranteed quality. In this article we will characterize the nitride layers that are generated by different nitriding processes and compare their respective wear characteristics. Most steel gear applications require appreciable loads to be applied that will result in high bending and compressive stresses. For the material (steel) to meet these performance criteria, the gear must be heat treated. Associated with this thermal processing is distortion. To control the distortion and achieve repeatable dimensional tolerances, the gear will be constrained during the quenching cycle of the heat treatment process. This type of fixture quenching is the function of gear quench pressing equipment. When it comes to setting the standard for gear making, the auto industry often sets the pace. Thus when automakers went to grinding after hardening to assure precision, so did the machine shops that specialize in gearing. But in custom manufacturing of gears in small piece counts, post-heat treat grinding can grind away profits too. This special advertising section highlights exhibitors from Gear Expo 2017 and ASM Heat Treat 2017. Don't miss these exhibitors co-located with Gear Expo. Your guide to the booths at ASM's Heat Treat 2013 show. Interviews with exhibitors at ASM's Heat Treat 2013 exposition, which is co-located with Gear Expo. Ajax TOCCO induction heat treating systems are being used successfully throughout the world for hardening, annealing, stress relieving, tempering, brazing, bonding, shrink fitting, and many other processes requiring fast, efficient, economical heating. These processes are being applied to virtually any shape of part ranging in size from fractions of an inch to substantial lengths and diameters. With more than 90 years of technical development and experience, Ajax TOCCO analyzes customer’s requirements to provide reliable, efficient, and cost effective solutions to meet their needs. SECO/Vacuum Technologies (SVT) is a new company from SECO/WARWICK designed to provide vacuum furnaces and related professional services in North America to ensure that we deliver the best experience to our American customers: Focusing on North America for sales and support; Offering production-size demonstration furnaces for process validation; Expediting delivery of all components, controls, and support documentation; Providing US-based local service teams, including installation and maintenance support; Including aggressive pricing and delivery programs to meet your project needs. SECO/WARWICK provides industrial metal heat treatment furnaces used in a variety of processes for material finishing and component manufacturing applications. We supply furnaces to customers involved with steel and aluminum production, aluminum recycling, forging, automotive, aerospace, commercial heat treating, HVAC/R, electronics, wind energy, medical equipment and nuclear industries. Solar Atmospheres specializes in vacuum heat treating, vacuum nitriding, vacuum brazing as well as vacuum carburizing services. With processing expertise and personalized service, Solar will process your small or large parts efficiently with our unique range of over 60 vacuum furnaces. Sizes range from lab furnaces to the world's largest commercial vacuum furnace. B & R Machine and Gear Corporation is a family owned and operated gear manufacturer since 1974. We are a custom gear facility, manufacturing gears to customer supplied blueprint specifications and/or samples.